See yah all in game! Hey there and welcome to our forum! Ahh you chose SA-Pearl as server I don't know since how long you have been playing Warspear already and I don't know at what level you are/how good your chars are, but I strongly suggest you to change your server, US-Sapphire would be the best choice for you since there are also a lot of Indian people playing and that server is almost overpopulated so you wouldn't have to worry about less people being there :P The only problem at US-Sap is that you can't create an Elf/Chosen character because the Sentinel faction is already overpopulated. You can join the Legions though :) Eu-Emerald is as active as well if you would like to play on the Sentinels side. xd nah she is elf: bluebird. Well it depends on if you and your friend still have your old accounts, otherwise you won't be able to create new elf chars on US-Sap. The Legion side is still open for everyone. Are you guys planning on building pvp or pve chars, or one class which is good for both? Warspear ain't for casuals so you might be on a good path here. Also welcome, I've tried a bullet hell game once, and also like hard games. mage is an op pve class sure but damn damn expensive, hard to build mage as a first class if u don't pay cuz u'll need another char to earn gold first. if u gonna play on mc i strongly suggest necro . OP dmg buff, a lot of AoE skills at high lvl. Good support (2dmg buff skills: dark power and infection + snake decreases def + mental pit reduces dmg), ok healer even if only one heal bcs instant heal very efficient with cooldown, and a lot of dmg with good AoE dmg skills (infection, poisonnous shield, acid rain and fateful connection but that last one not really powerful if u don't spend points in it). Life exhaust when using skills is a little annoying at the beginning but u quickly get used to it and if u manage to get some life steal it's not a problem anymore. all classes can be good at pve. just choose ur build. avoid warlock: can be usefull for dgs bcs of crowd control and boss stuns, but it's really much more a pvp class. I can confirm that it is possible to make elf/choosen on US sapphire again, tried yesterday. Oh really?? Even on a new created account on which have never been any characters before? Hmm, is there a difference if the account is new or not? tested on all my existing accounts and it works. 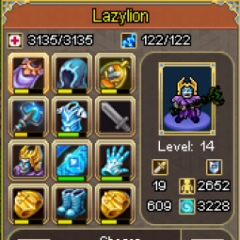 Even tested how many i could make on those accounts, maxed my slots with 13x elfs. Deleted em all after ofc. EDIT :- And by Mage you all are referring to Warlocks/Mages, right? Or Druid/Necromancer? And also suggest class for my friend, we play together so our class roles will probably canceling out each other's flaws. I don't know iif it's really needed here, if it's not, we would get same class Haha. With Mage I was refering to Mage only and not to any other class. And there actually are a lot of crowded mobs in dungeons and Mage has that one aoe skill which has the ability of a chance to stun. Yes here mage means mage class only. the area dmg is really really useful and for sure mages are OP in PvE, even against bosses or single mobs they are good. If u play as a team with ur friend, then u might be able to lvl up a mage without struggling too much. but i think Julie is right: playing two mages will be still hard, the best is that one of you takes an healer class. if u really want two mages i suggest u both make mage and healer and when one is playing healer the other takes mage. but u'll need twice as much time to up since u got two chars to developp. one tip: make a chosen, for the beginning i'll be nice to be on same map. pala is good if u don't want healer, it can do many things: crowd control, agro boss, a little heal.